The Avon Eagles have dominated the SWC for the last two seasons. Going 20-0 in regular season play. Following a shocking upset in the opening round of the 2016 playoffs at Home against rival Avon Lake, the Eagles rebounded nicely by running the regular season slate again in 2017. In 2017, first year starting quarterback, Ryan Maloy had a terrific season. He had started a game in 2016 as well, but his first year under center couldn’t have gone any better. He led the Eagles to the State Semi Finals, before falling to powerhouse Arch Bishop Hoban. Avon actually led in that late second quarter before it all came apart. The previous week in the Elite Eight, he led the Eagles to a dominating 55-14 victory over fellow SWC top runner Olmsted Falls. 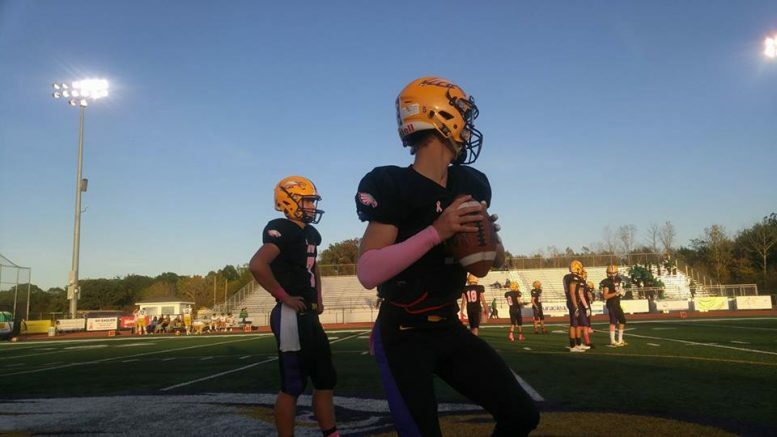 It was all part of a wonderful year that saw Ryan Maloy finish with 2,129 passing yards and 20 touchdowns in the air. He also ran the ball well, compiling 529 yards and scoring 9 times on the ground. Maloy and the Eagles will have their work cut out for them this season as they lost a good amount of quality starters to graduation. They will only have 5 returning starters on offense, and 4 on defense. They truly lost some big names, including big tight end Vlasi Pappas. Pappas was a regular threat for Maloy before injury ended his season early last year. Also graduating was Wideout and star Chris Mullins along with running back and top yard gainer David Orlando. Another key cog missing will be Tony Eberhardt. As tough as it will be to replace these weapons around Maloy, he still has quite the cast and crew surrounding him. Returning threats include wideouts Tommy Purcell, Jake Parker and Parker Davis. Tailbacks who will need to have a big season include Mark Steinmetz, Nick Perusek and Aaron Endrizal. Head Coach Mike Elder will have them ready as they kick off regular season play at home this Thursday against the visiting Akron Buchtel Griffins. Toughest expected opponents – Akron Buchtel week one, Olmsted Falls week two, Avon Lake week three, Berea Midpark week ten.